As consumers, we're probably over the political ads, especially those of us living in swing states. And working in the media business, the political ads are certainly squeezing out and driving up the cost of our client campaigns. It's happening in TV, radio, and even online, including online videos. Online video advertising company Mixpo says demand for online video ad space will outstrip supply by 20 percent or more in 11 swing states. But it's the last crunch before the election; there's not a lot we can do. On a more positive note, we're seeing some advertisers using the election in their creative and social media campaigns. 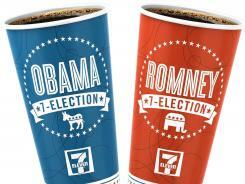 7-Eleven has promoted red/blue coffee cup selection for the past 4 presidential campaigns. A FedEx Office spot shows two candidates agreeing to a "clean" campaign while one is actually picking up snarky signs about the other. Boston Market is taking what might be a safer approach asking website visitors to vote between 2 meal choices, but using right-wing/left-wing language that might be inflammatory. We've all used borrowed interest before, either for ourselves or for clients. In this heated environment, is the benefit of relevance worth causing annoyance with our audiences? Let us know if you're seeing it work, or (perhaps more interestingly) failing spectacularly.